Continuing on with my “Rider Reviews” we are going to take a look at the Belstaff Discovery Jacket. This jacket, although discontinued by Belstaff, is now produced by a spin off company by the name of British Motorcycle Gear, so while this Jacket is unable to be purchased, the jacket is still manufactured to the same Belstaff standards under a new name, on the same original equipment. This Jacket Review was originally planned to write a first impressions review of this jacket at 1000 miles. But that passed, and I figured “Well, I’ll write a review at 3000” and then that passed and I was like, ok, how about after I get back from my trip? And that is where we are now. With now nearly 13k miles on this jacket since I have owned it, here we are. So lets take a quick look at the manufactures information. This is the Motorcycle Jacket Motorcycle Magazines raved about. Check out the link for press reveiws. The Discovery Jacket is for those of us that refuse to let the weather dictate if we ride or not. The Discovery Jacket has it all fully armored with a long list of design features to fit every riding condition. If your next trip is taking you around the world or back and forth to the office the Discovery will make sure you get there dry and comfortable. You may have noticed this jacket on Claudio in “The Long Way Round” or on your local London Motorcycle Courier. The Discovery Motorcycle Jacket is sure to keep you warm and toasty no matter where your riding takes you. As you can see from the manufactures description, this jacket is loaded. I came to the decision of purchasing this jacket while looking for a suitable replacement for the current one I had been wearing. Wanting a jacket that could be worn year round, I began my search looking for the perfect set of gear for the Pacific Northwest. My requirements were pretty extensive, not only did I need a jacket that could protect me from an unfortunate mishap, I needed one that could protect me from the cold, the rain, the wind, and yet be suitable enough to wear in the warmer months of the summer. I wanted a jacket that I could rely on, no matter where I was, and the Pacific Northwest gives us every type of weather one could encounter, so the jacket had to be able to easily keep up with the erratic weather changes. I came into hearing about British Motorcycle Gear while attending the Seattle International Motorcycle Show back in December of 2009. I rummaged through the booth at the time, not really paying much attention to the product, but just giving it a once over and paying attention to the quality of the product, what they offered and the prices for their offerings. When it came time to look for a new jacket, and I had looked at all of the other brands, I decided to shoot an email to BMG. The rain skirt really helps keep water from “creeping” up. The rain gutter incircles the entire inside lower part of the jacket, keeping water from building up inside. I basically said in the email what I said above. I need a jacket that does all of this, what do you have and what do you recommend? I quickly received a response from Paul Brooks, the US distributor of BMG’s products with a couple suggestions of jackets. After a couple more exchanges and looking at their offerings, I decided on the Discovery, and with this, he presented me with the chance to pick up one of the last ever produced Belstaff Branded Discovery Jackets. The current Jacket offering only comes in black. The jacket I would be receiving was dark drab green. Something different. So with this, I also purchased a pair of the EZEon Pants. Which I’ll save the details for another review. This first thing I noticed as I pulled the jacket out of the box, was its weight. The jacket is relatively heavy compaired to my other one. The material used on the shell seems to be a bit thicker, which overall is going to provide a better amount of protection. Secondly, the added weight comes from the design features of the jacket. Instead of a tough, waterproof outer shell, and a mesh interior like most jackets, this one provides a 3rd layer sandwiched in between the inner layer and the outer layer. 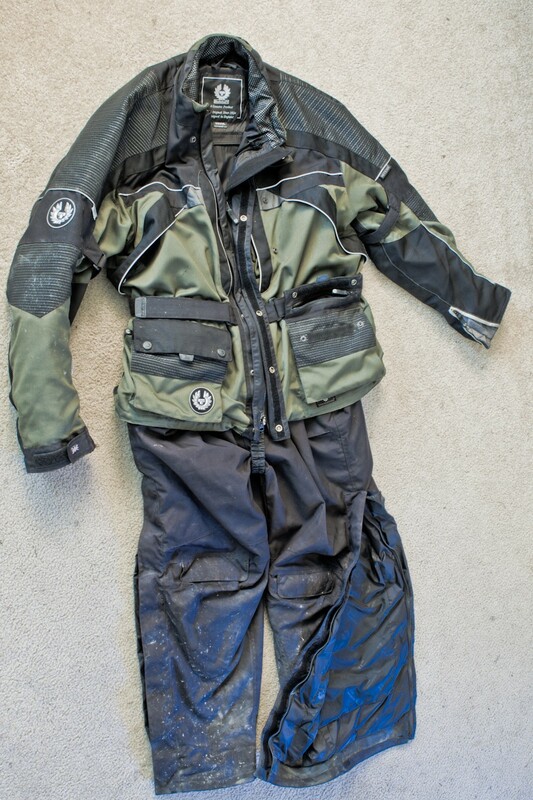 Belstaff, upon the design of this jacket, really thought outside the box on how to deal with wet weather riding, and it shows in the ingenuity that was put into the jacket. Instead of trying to stop water at the first layer, like other water proof jackets, using materials that are expensive, due to their qualities of being both wear resistant as well as water proof, or by utilizing multiple treatments of a water proofing agent that you have to continue to keep applied, they went with a tough outer shell that allows water to pass through. Fleece lined, this liner acts as a standard jacket with a full length front zipper and storm flap secured by buttons. Two hand pockets on the sides to help keep your hands warm and an inside pocket for documents or a cell phone make this jacket liner the best I’ve seen to date. Behind that shell, is the ingenuity of the jacket. There are plenty of materials out there that provide excellent water proofing, however they are not suitable for protection in the event of an unfortunate accident. This is where the middle layer comes in. Utilizing a better material for the job, they draped the entire gap between the outer and inner shells with this material, running it down to the bottom of the jacket, then installing a “gutter” at the bottom. A rubberized mesh that allows water to basically fall right out of your jacket. A rubberized elastic band along the lower portion of the jacket makes sure that the jacket stays snug against your body, preventing wind and water from sneaking up. Another feature, I had not yet seen on any offering, was a strap that extends from the rear of the jacket, between your legs, and buttons on into the inside of the front preventing the jacket from hiking up while you ride. This also assists in keeping your riding pants from working themselves down, a common problem I’ve ran into with overpants while walking. The storm flap along the front is also very secure. Once zipped up, there is a series of buttons as well as hook and loop to keep the flap secure, preventing any rain or wind in through the length of the zipper. The jacket also comes with a removable neck guard that attaches via a full circumference zipper along the neck line, and is held in place by snap buttons, as well as hook and loop. The neck guard is insulated as well as lined with fleece, and is very comfortable when wearing. If the day warms up, it is very easy to remove without removing your jacket, and while you can put it on while wearing the jacket, it does take some practice! The guard is also long enough to go up to, and fit snug against your chin. By using the neck guard, and a full face balaclava, you can eliminate cool and moist air from getting up and personnel with your face and provides excellent protection from the elements. To keep you warm, the jacket has a removable inner jacket. This is a jacket in its entirety. Unlike other jackets I have owned, or tried on in the past, this liner is a full sleeve liner that has its very own buttons and zipper to zip up and wear separately from the main jacket. It’s odd to figure out, and isn’t going to win you any fashion awards, but its main purpose is function, and it nails it. The “Crotch Strap”. Keeps your jacket down and your pants up. Fleece lined, the jacket is extremely comfortable against bare skin, vents well, and is extremely (and I want to reiterate this), EXTREMELY warm. Between the fleece, the insulation and the infrared reflective material, this liner can be at times too good. The jacket also has a long zipper in the lower rear of it that opens up a spot so that your pants attachment zipper can be fed through, and zipped to your jacket. This helps keep your liner in place as well, to keep it from creeping up on you while riding. It is little details like this that you find throughout the design of this jacket. I have decided on not using it while riding in weather above 40 degree’s, as it will warm you right up! If you are doing a lot of riding for a long period of time, without much slow down, then it will work fine for anything below 50. For the warmer temps up until the point of where I can wear the jacket without any other base layers, I just wear a micro fleece jacket underneath without the jacket liner. The liner really is great. It is the warmest liner I have ever experienced, and within minutes just wearing it inside, you will want to pull it off. This makes this jacket extremely valuable for our Northwest weather for the off season. Jacket venting for the warmer weather is through an under arm zipper vent located on each side of the jacket, as well as 2 rear back vents located on the outside edges. The placement of the rear vents is enough, so that if you wear a backpack, venting still takes place. Unlike my other jacket, where the rear vents are more inward, and get blocked by my backpack I wear for commuting, as well as the skinny camelback I wear while on extended rides. 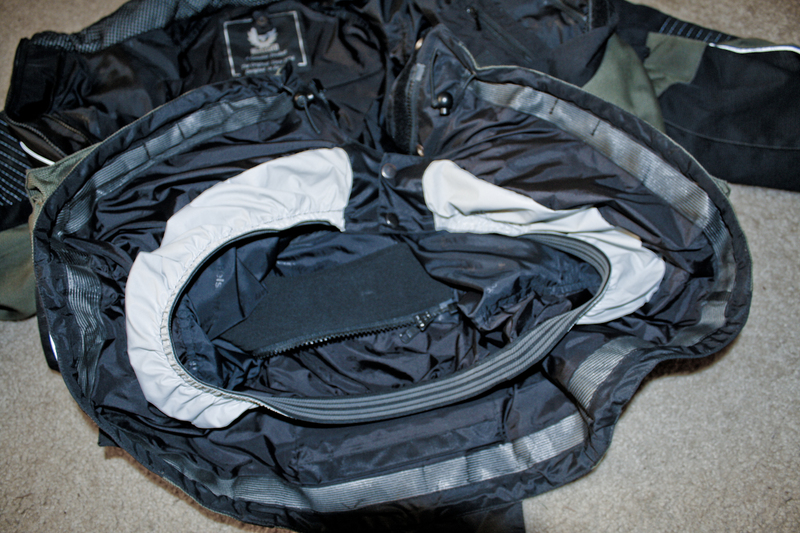 The jacket, as well as liner have several pockets to stuff documents and other tid bits in. There are 4 pockets breast level, 2 large flap lower pockets with the zipper in the flap, so that water doesn’t creep through, and 2 “hand warmer” hook and loop closure pockets on the outside, located behind the lower pockets. Inside the jacket, you have a nice large zippered pocket on the left hand side, and another unzippered pocket on the right. The left hand pocket is large enough to put your passport, and other important documents you want to keep close to you, but out of the way and incorporates a “snug strap” to help keep it bundled tight. The rear of the jacket has a large removable pocket. Large enough to put documents in, the pocket zips off completely, and is able to be removed and left off if desired. I figure one could also put a hydration pack in here if they wanted with an extended tube. Myself, I have left it on, but never have used it. The liner jacket has 2 outside hand pockets, as well a a single zippered inside left breast pocket. All in all, the jacket system has an astonishing total of 14 pockets. Another feature that I love about this jacket, is the over sized gussets for each arm at the wrist. Zipped out, they are more than enough in size to put on full gauntlet gloves with ease and run them under the sleeve. They then zip up snugly and the adjustment strap allows you to cinch down the wrist cuff to your desired liking. The jacket has a ton of reflective material on it. From reflective piping, to reflective thread sewn into the upper arms, the jacket provides plenty of night time visibility. A safety factor we can all agree you can never have to much of. Protecting you from impact, the jacket incorporates a full set of high quality Knox Armor. So the question is, you are probably wondering, how does this jacket actually perform in the wet? All of these features, all of these pockets, surely it has to let something in, right? The answer would be, No. And I have put it through some extreme weather conditions already. As I set off for my Arctic trip, I took along my Tourmaster Defender Rain Suit, just as a “Just In Case”. I have been through rain with this set already without issue, in fact, I endured 4 hours straight from Seattle to Spokane, but it was off and on, and while I had trust in it, I just felt it best to take an backup set of rain gear. However, leaving from Watson Lake to Whitehorse, which you can read in my Day 5 log, Doug and I encountered rain that would last the entire day. And not the off and on type of rain, but constant rain. The jacket system worked flawless. Pulling into Whitehorse just as the rain finally let up, and fueling up, I was relieved that the jacket (and pants) worked so well. The jacket has held up great. Now with pushing over thirteen thousand miles on it of various types of weather and riding, I can say this is to date my favorite piece of gear I have owned. The quality of construction is remarkable, the features are rock solid, and the price is far below its competitors for jackets that are not nearly as featured. This jacket not only made me a believer of BMG’s offerings, but a customer who will return to them to buy other offerings. Currently I am looking at purchasing the Adventure Jacket and Pants system from them. This is a light weight system made for summer/warm weather riding. I would like to get this system for riding where I am not expecting it to get below 60 degree’s in the summer, and it incorporates a long list of features as well that makes me excited to eventually try it out. With our summer riding season just now at about halfway, it will be a purchase for next year, and I will most likely wait until they show up to the Seattle International Motorcycle Show to purchase. If you want a jacket that will keep you warm, keep you dry, and work as advertised without having to fiddle with those sprays or wash in water proofing chemicals, this is the jacket for you. Apparently I took pictures when it was brand new!